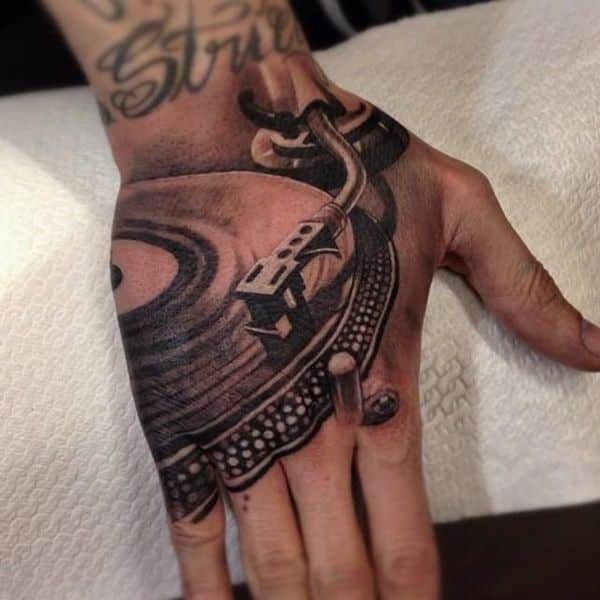 There are not many chest headphone tattoos, and even less that are this good. 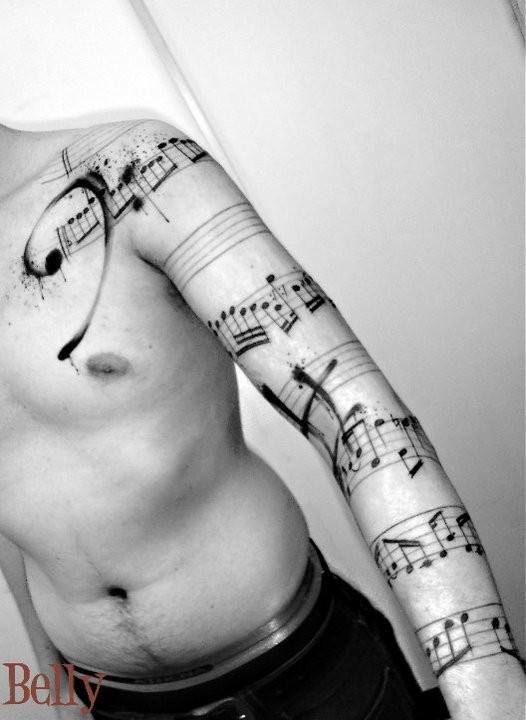 The medium sized tattoo portrays headphones that vibe out the music signals. 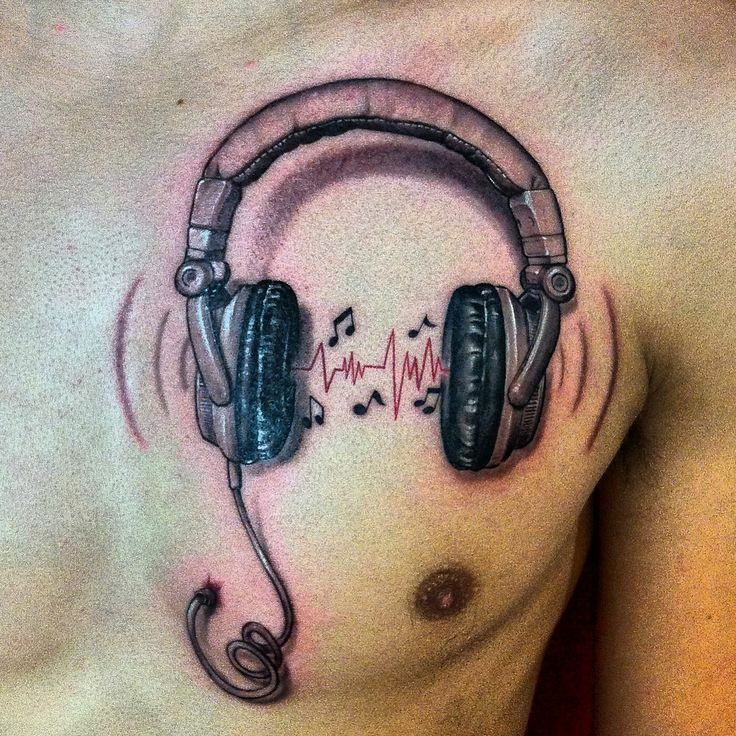 With the headphones plugged right into the heart, the tattoo sends an obvious message. 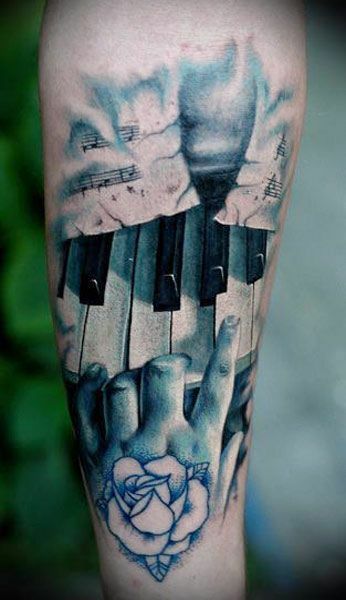 The tattoo shows a piano played by an artful hand. An airy note of pale blue gives the feeling that we’re witnessing an intimate scene that we don’t fully understand, and nor are supposed to. It’s a sneak peak at the music creation or indeed at the creative process on the whole. The powerful, bashing strokes of red emphasize the presence of the clef and the rose among the notes and speakers. But the most intense red goes to the A encircled – the symbol of anarchy. Back in the old days of boomboxes, the music cassettes were nothing to be unfamiliar with. 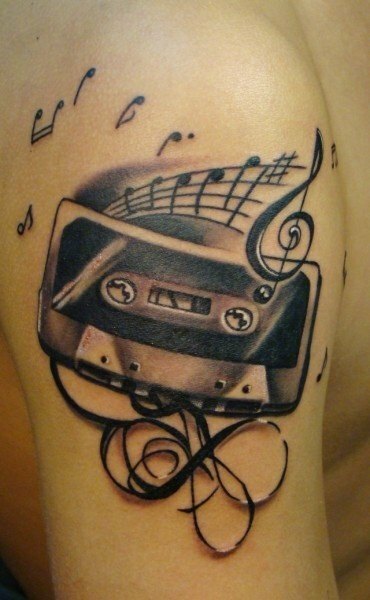 Now, with them falling out of fashion, cassettes prominently feature in the music tattoos for guys. This one, with the tape winding about, tries to conjure up the days long passed. 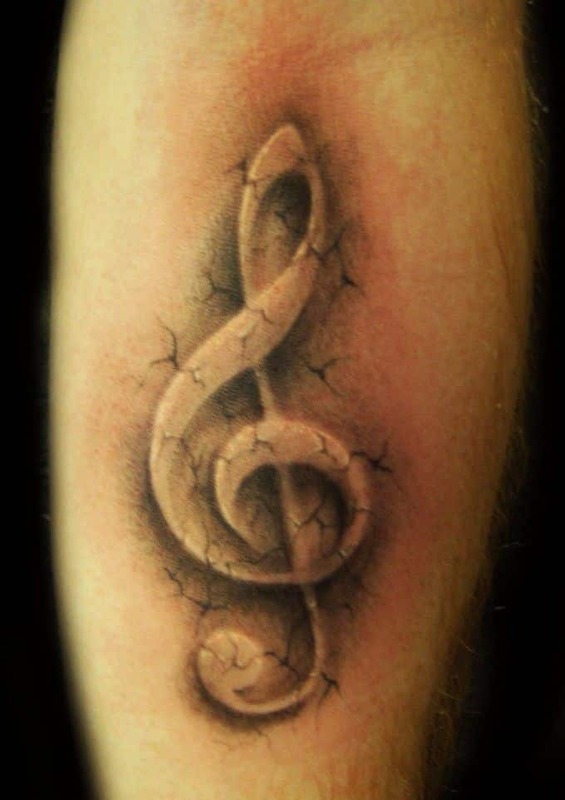 This is a rather unusual portrayal of a treble clef. Seemingly cast in stone, the clef is ornamented by the multiplicity of cracks around it. It is almost as if the music itself tries to break free from the bonds of the body. It’s yet another representation of a treble clef, albeit a completely different one. We don’t get the clef’s full shape here, only the few casual brushstrokes that suggest it. The vivid red offers much needed refreshment, lending its vigor to the bold blacks about it. 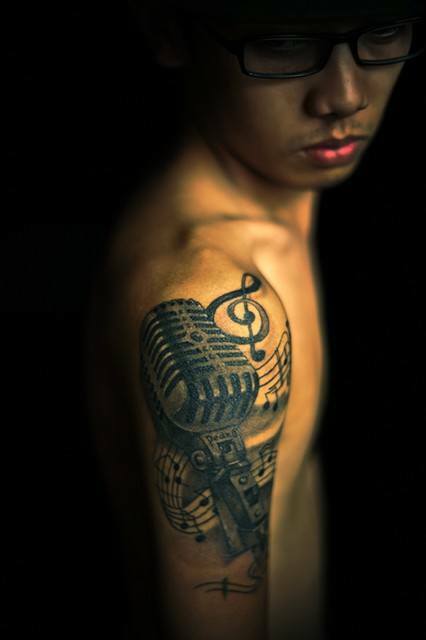 The vintage black & white tattoo depicts a gramophone, transforming the back of a hand into a music-radiating machine. The tape’s oval shape pushes to a circle, even catching the fingers along its path. Follow the seemingly endless tape of staff as it unwinds across the forearm. 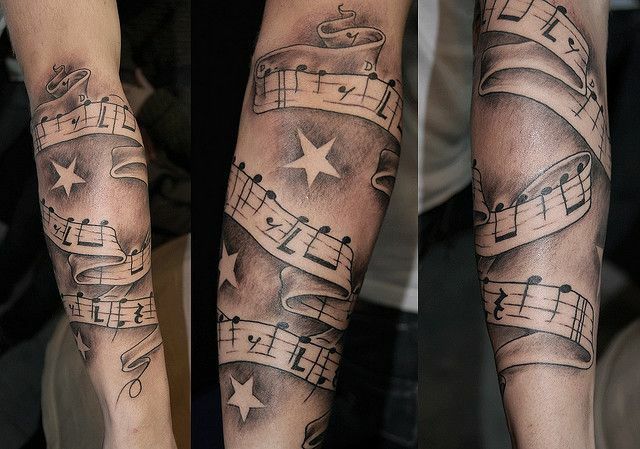 The tattoo, decorated by stars among the shaded space, symbolizes the uninterrupted flow of music across the ages. An entire arm needs to be devoted to this tattoo. But once the devotion is made, the arm will be the host of a music piece coupled with the intermissions of black ink forming unusual shapes. 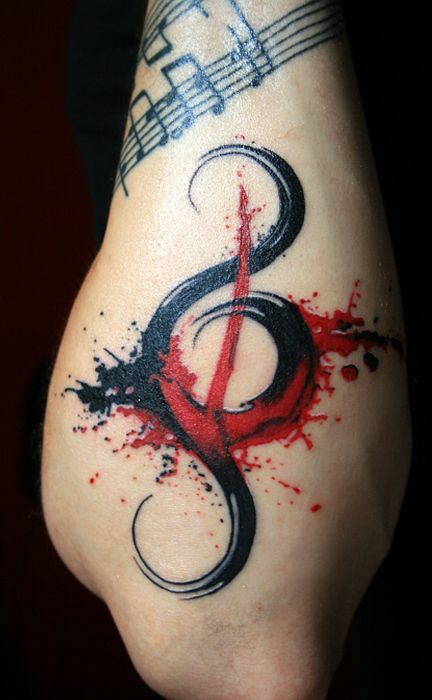 This tattoo makes the most out of your shoulder, depicting a retro mike with the musical notes curling in the background. The stylish treble clef, by looming above, also makes its appearance.